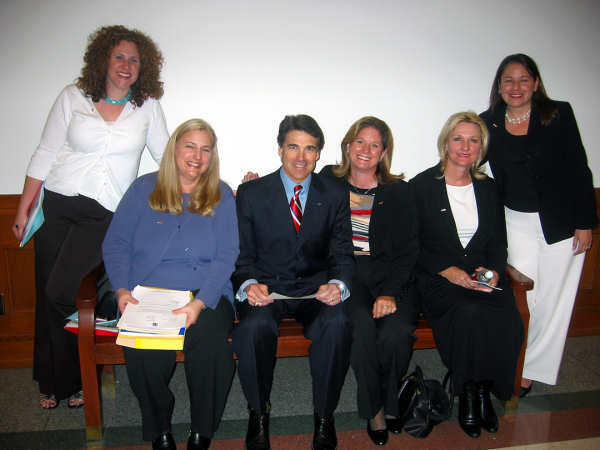 With HomeSpring Residential Services Division of Hogan Real Estate Services visit with Texas Governor, Rick Perry during a San Antonio Apartment Association's and Texas Apartment Association legislative trip to Austin. Our principles have been responsible for the management of over 6,000 units. Cumulatively, our firm has over 75 years experience in all areas of this industry, with 35 years in multifamily management. Our strength is in the fact that we only commit to manage a minimum number of units at any given time in order to assure that we can always devote the time and resources necessary to ensure every community is always a priority to us. We have considerable experience in working with both conventional and government insured mortgage programs such as HUD and other governmental agencies. Our accounting systems and management polices are geared to ensure that we are always in compliance with any community regulatory or lenders operating agreement, as well as local HUD procedures. HRES is an approved HUD management company that has a good working relationship with the San Antonio HUD office and we are familiar with the requirements of TSAHC and TDHCA. HRES has managed properties directly for HUD and HUD/FHA insured properties for others. HRES has never failed a HUD inspection and has consistently received scores between 86 and 94. Our staff is familiar with, and had experience with, income certification processes for tax-exempt bonds as well as bond compliance reporting to the Trustee and Owners. Our supervisory staff is highly skilled and extremely involved in all facets of property management. Our normal management plans calls for regular in‑house training classes to be held covering: fair housing, OSHA compliance, leasing techniques, preventive maintenance, and new legal issues. In addition, all staff is sent regularly to Apartment Association training. Our staff supervisors (Lou Flores and Ginger Miller) are both instructors at the San Antonio Apartment Association. Both instruct classes for the Certified Apartment Manager and National Association of Leasing Professional Designation programs. 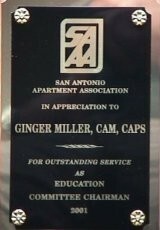 Ginger Miller is a National Apartment Association Approved Grader and Instructor. Both Ms. Miller and Ms. Flores have completed certifications for the LIHTC program of the IRS tax credit certification. HRES provides due diligence consulting during the acquisition process and aiding the prospective owner in establishing a Marketing Plan and budgets. GINGER MILLER ,CAM, CAPS, NCP Vice President and Property Manager, joined Hogan Properties Company, Inc. in September of 1983 after four years as Public Relations Manager at American Business Equipment. During her time at American Business Equipment, she received numerous awards including Outstanding Employee of 1982. Ms. Miller was the youngest person ever awarded Best Salesman and the Humanitarian Awards from Dale Carnegie. 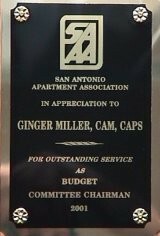 Ms. Miller is very active in the San Antonio Apartment Association (SAAA). She is past President. She serves on the Board of Directors Executive Committee and the Government Affairs Committee. She is the past Chairperson of both the Education and Budget Committees. In 2001 she was elected Treasurer of SAAA and is the 2002 Vice President-Elect. Ms Miller is the past Chairperson of the Professional Designate Committee and is a National Apartment Association Approved Grader/Instructor for both the National Association of Leasing Professionals and Certified Apartment Manager classes. She served three years as SAAA's representative to San Antonio Water Systems' Citizen Conservation Steering Committee and was named the 1998, 1999 and 2002 CAM of the year by SAAA. 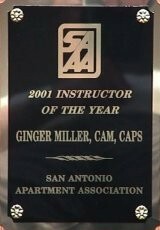 Ms. Miller was the recipient of SAAA's Super Star Awards in 1999 and 2000 and is the 2001 Instructor of the year. She also serves as a voting delegate to the Texas Apartment Association and TAA government affairs committee. Ms. Miller's responsibilities at HOGAN REAL ESTATE SERVICES include all aspects of property management, budgeting, administration, personnel, occupancy control, Bond and Tax Credit compliance and tenant/resident relations. Some of her experience has been in conjunction with a with a 52-acre, mixed-use business park which currently includes 315,000 square feet of office space, a 145-unit hotel, a 248-unit apartment complex, health club and a self-contained telephone communication system providing local dial tone and long distance service to the tenants of the business park. Ms. Miller's Apartment portfolio has included all property types (low income, Section 8 to Class "A"). In addition to her in house and "third party" management responsibilities over 1,540 units, she helps formulate the marketing plans and trains new managers for her company's 748 apartment units currently under development and planed which will be completed in 2005 and 2006. In addition to management, she has proven herself an exceptional "people person" and continues to enjoy "hands on" marketing and leasing of the projects for which she is responsible. Property Supervisor joined Hogan Real Estate Services in November 1996. Specialized tasks include: budgeting, marketing and working successfully with her team members. 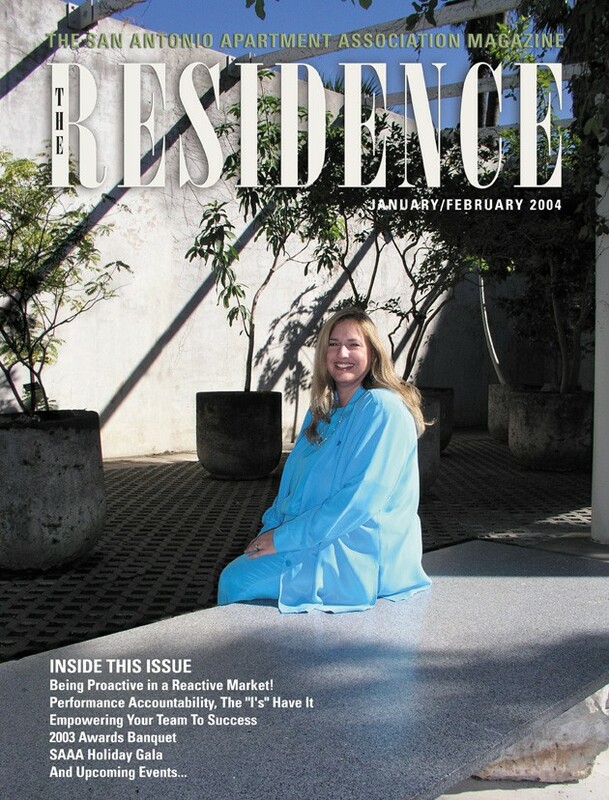 She has committed herself to property management for the last seventeen years. In doing so, she has earned her Certified Apartment Manager Designate. Lou is also a member of the San Antonio Apartment Association, serves on the Education & Government Affairs Committee and is an approved Instructor for the Association. Ms. Flores was a Chairperson of the Professional Designates Committee of 2002. She is a Director on a Governing Board of a Non Profit Housing Association dedicated to bring affordable housing to Texas communities. She has successfully completed the Blue Shield Program and Citizen Police Academy sponsored by San Antonio Police Department. Her experiences have been supervising 606 units at 6 different sites. She has in the past managed multiple sites at one time and managed a complete rehab on a 432 units with thirteen employees on her team. Natashja joined Hogan Real Estate Services as a Leasing Consultant at Eagle Ridge Apartments in July 2003. This was an excellent starting point because this is where Natashja acquired her Tax Credit Housing experience. As a Leasing Consultant, she was able to participate in the lease-up process of Eagle Ridge (280 units). In November of 2003, she was offered the opportunity to become Assistant Manager. As the Assistant Manager, Natashja became responsible for a wide variety of functions, but mainly the bookkeeping and resident concerns of Eagle Ridge. During her career as an Assistant Manager, Natashja was given the opportunity to participate in a property takeover, where she learned all aspects of Bond Compliance. Just recently, Natashja was appointed as Hogan Real Estate Services Compliance Director. In this position, she overlooks the file maintenance and compliance reporting for all properties managed by Hogan Real Estate Services/HomeSpring Residential Services In addition to her compliance responsibilities, Natashja is also working on earning her CAM this year.